Posted in Climate Sock, Energy sources on October 21st, 2013 by Leo – Comments Off on Should Labour pledge to abolish taxes on energy bills? Carbon Brief’s new poll shows how little support there is for shale gas fracking in the UK. But while the poll suggests supporters of shale have problems to overcome, it also shows that anti-frackers have a real challenge ahead. Shale gas wells have the lowest support out of any domestic source of energy. Fewer than one in five would support the building of a shale well within 10 miles of their home: that compares with more than half who support wind turbines. But opposition to shale isn’t yet solid. There are still 40% who aren’t sure either way about local fracking, and fewer opponents than there are for both coal and nuclear. The argument can still swing either way. 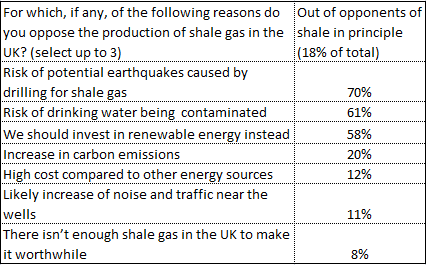 And dig into the reasons for people’s opinions about shale, and it’s clear that both sides have problems. The reasons why people support shale are strongly angled towards its being a crucial source of energy for the country. This is a winning argument if the debate happens on a national level. Everyone knows we need some kind of energy source, so if people agree that shale can provide secure, low-cost domestic energy for the country, it’s hard to find a national-level argument that beats it*. But this only works if fracking will happen in, say, desolate and sparsely populated places. It’s less effective if fracking happens where people live and you’re facing emotional** arguments. The reasons for opposition to shale indeed show the challenge for its supporters. Earthquakes and contaminated drinking water not only sound horrible for people living near wells – they’re also outrageous enough to mobilise outrage across the country. If the country believes that fracking causes so much local damage (regardless of whether it does), the benefits of energy security aren’t enough to win the argument. But this is also a major problem for anti-frackers – who have a big decision to make. Carbon Brief’s new climate change and energy poll is just out and has loads of interesting results again. The most striking is that three times as many people would support new wind turbines within 10 miles of their home than would support a shale gas well. Local fracking has the lowest support of any energy source out of all those tested. This is despite the media opposition to wind farms and the political backing for shale gas fracking. Support for local wind turbines outweighs opposition by a factor of at least 1.8 in every UK region. Even among Tory voters, support (45%) is greater than opposition (31%). For shale, no region can muster more than 21% support*. Little more than one in four (27%) of Tory voters would support a shale well within 10 miles of their home. Part of the low support for fracking is a lack of knowledge about it – so many people are still undecided, rather than opposed. But even with lower knowledge, more people would oppose local shale gas wells than would oppose wind turbines, gas power stations or even coal mines. A longer piece on campaigns and communications about fracking will be up here shortly. * Ironically, the greatest support is in the North East – but still only 21%, against 33% opposition. How worried are we really about energy security? Posted in Climate Sock, Energy sources on August 29th, 2011 by leo – Comments Off on How worried are we really about energy security? Last month we saw data on whether climate change or energy security is seen as more pressing. The results were interesting. They suggested that people were more willing to reduce their energy consumption to help the environment than to protect the UK’s energy security; yet it also seemed that people wanted the government to prioritise protecting the energy supply over providing more environmentally friendly electricity. It’s since been pointed out to me that the wording of the ‘personal responsibility’ question may have had a misleading influence. The option for energy security was phrased as ‘To conserve energy now to make sure the UK has enough in future’. As was suggested to me, an interviewee might take issue with the implication that there are transferable units of electricity that can be used immediately or saved for later. Of course not using a unit of electricity today doesn’t mean that the unit will continue to be available tomorrow. So perhaps my conclusion, that individuals see themselves as having a greater role in tackling climate change than they do in tackling energy security, was overstated. And in fact another poll suggests exactly that. What difference has Fukushima made to attitudes to nuclear power? Posted in Climate Sock, Energy sources on August 20th, 2011 by leo – Comments Off on What difference has Fukushima made to attitudes to nuclear power? One of the idiosyncrasies of the nuclear industry is that they love polling. As a result we have a pretty good idea of what the world thinks of nuclear power, and how it’s changed over the years. Charmingly, they’ve kept at the public polling after Fukushima, and so we can see how opinion’s changed after that, too. This is really useful because with an event this prominent, the media tend to assume that the public have been paying attention, and that public opinion must have undergone a dramatic shift. Sometimes this is fair. The MPs’ expenses scandal did capture public attention and brought attitudes towards politicians even lower than they had been before. But other high-profile media stories, like the UEA email release, came and went without having all that much impact on public opinion. In the UK and US at least, Fukushima is looking like the latter kind of story, where a lot of media attention doesn’t lead to much of a change of attitudes. So “nuclear” seems to have got more news coverage than “news of the world”, but been used slightly less in searches. We get something similar (with fewer hits) if we use “Fukushima” or “hacking”. Is keeping the lights on more important than stopping climate change? How far people are willing to take personal action to prevent climate change is one of the big policy questions. When considering a major global issue like climate change, many people will consider that they cannot have an impact, and that they should leave it to the government, if indeed they think it’s worth tackling at all. A new poll by ComRes tackles this question. Having been commissioned by Centrica, its focus is on domestic energy usage, and it suggests a tension between what people are doing now and what they might be willing to do in the future. That price should be top isn’t surprising, but I’m struck that nearly twice as many say they reduced their energy use to help the environment as say they did so to protect the UK’s energy supply. This surprised me a little because polling I’ve seen in the past has shown that, as reasons for energy conservation, energy security is generally more compelling than climate change. And we do in fact see something similar in a later question in this poll. 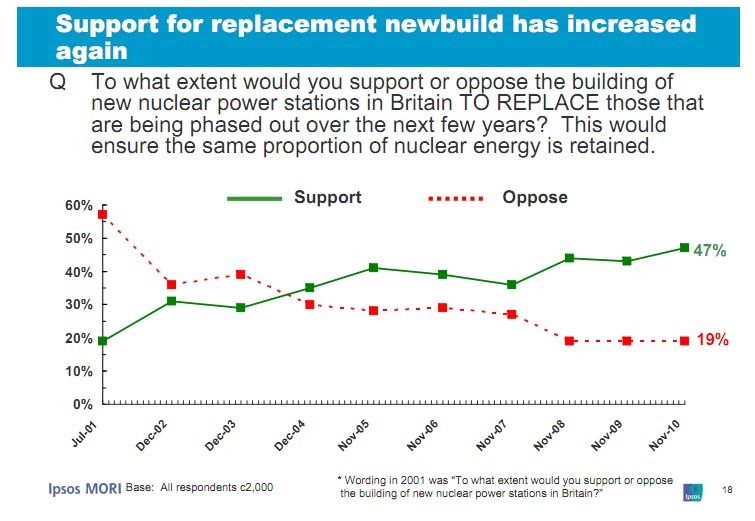 As expected, we’ve started seeing a flurry of polls on attitudes to nuclear power, post-earthquake. For now I’m going to focus on the UK polls, though there look to be a lot of non-UK polls too, and I’ll try to cover those soon. Two have come out in the last few days: a YouGov/Sunday Times poll, which included a few questions on nuclear among other issues; and a poll commissioned by Friends of the Earth, and conducted by GfK NOP. On the latter, just because it’s commissioned by a group who’re campaigning on the issue, doesn’t mean there’s anything dodgy about it. They’ve been good enough to release the data, and there doesn’t strike me as anything leading or suspicious about it, particularly the first question (which is the only one I’m using here). No surprises that support for nuclear energy has fallen. I was a little surprised, though, by the relatively small size of the drop in support for building nuclear plants to replace those that are being phased out. Before the earthquake, Mori in November last year found 47% support / 19% opposition. Now, we see 35% support / 28% opposition in the GfK NOP poll (the YouGov poll had no equivalent question). Putting this in context of the last few years, it only takes support for nuclear energy down to the level it was at in late ‘07. And while it’s fallen significantly since late last year, there’s still a majority in favour of replacement. 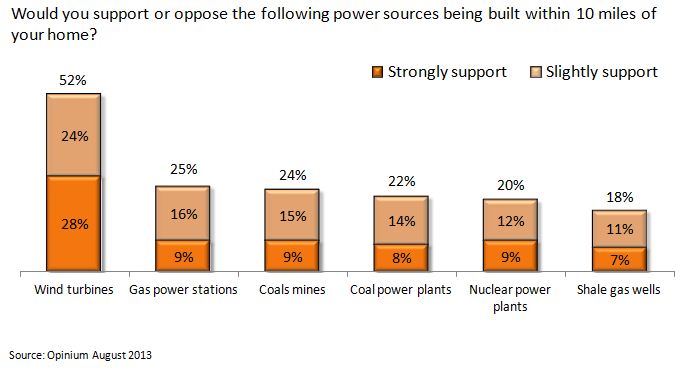 It’s not often that you see an issue so divided on gender lines as these polls show attitudes to nuclear power to be. Caring about international public views on nuclear power shouldn’t be at the top of many people’s to-do list right now. For one, donating to the Red Cross should be a lot of places higher (and that’s also, sort of, what I’m going to write about). But pretty soon now, once the stories from Japan of individual tragedy and wonderful survival have been played out, much of the media will turn to the question of whether nuclear power is safe. And a part of that reporting will be, whether people think that nuclear power is safe. We can safely assume that public enthusiasm for nuclear energy, around the world, is right now taking a battering (as I write, there hasn’t been a nuclear disaster). We can also expect that a lot will be written about public attitudes to nuclear power. What I want to do here is collect some of the international data from polls conducted before the earthquake. In summary from those polls: over the last decade (and possibly longer), overt opposition to nuclear power has fallen significantly. Now (that is, from polls taken before the earthquake), a majority would support the introduction, or continued use, of nuclear power as one of the ways of generating electricity. I’ve written a couple of times before about attitudes towards nuclear power in the UK, most recently here. That said, other UK polls have shown that though nuclear power may not be so widely opposed as it had been before, it’s seen much less favourably than other forms of power generation. Nuclear only noses ahead of gas and coal when it’s put in the context of global warming and climate change. Read more on that here. From time to time a news story comes out citing a poll that isn’t in the public domain. These articles are written on the basis of a press release – apparently all the information the journalist has about the poll. Given that journalists are supposed to be a cynical bunch, this always strikes me as surprising. By writing up the data from the press release without checking the poll themselves, they’re taking a leap of faith that they’ve been given a fair representation of the truth. Since these press releases (of course) show results that are helpful to the organisation that commissioned the poll, you would expect due diligence for a journalist to include checking the data. A recent poll by EDF Energy, carried out by ICM, shows why this matters. The research was conducted among 1002 adults living near the Hinkley Point Power Station, and asked about their attitudes to nuclear power and the possible construction of a new plant. On the strength of the poll, EDF put out this press release, in which they said that “Nearly four times as many local people support plans for a new power station at Hinkley Point than oppose it”, and that “63% support the development of Hinkley Point C”. The press release was picked up quite widely by local media, including the BBC. Nice job by their PR people in winning positive local coverage. Fortunately, ICM is a member of the British Polling Council (BPC) and abides by its rules. These rules are strongly weighted towards transparency, and include the stipulation that where research findings have entered the public domain – as in this poll – the full data and complete wording of the questionnaire must be made available. As ever, ICM have done this, and we can look at the data here to test out EDF’s claim. Firstly, there’s no dispute about the figures they’ve issued. As they say, 63% are “strongly in favour” or “slightly in favour” of the potential development of Hinkley Point C, and only 17% are slightly or strongly opposed.